10 Under 10: The American Dental Association announced the winners of its inaugural 10 Under 10 Awards, which honors new dentists making their mark on the profession. From left to right, top to bottom, Drs. Vanessa Benavent; Jon Copeland; Gerald E. Davis II; Mai-Ly Duong; Michael Kroll; Christine Meiners; Hubert J. Park; Kristopher P. Rappold; Amisha Singh; and Katie Vincer Sears. Young dentists do amazing work every day. You know that you don’t need to be in practice for decades to have a massive impact on the dental profession, your peers and your community. 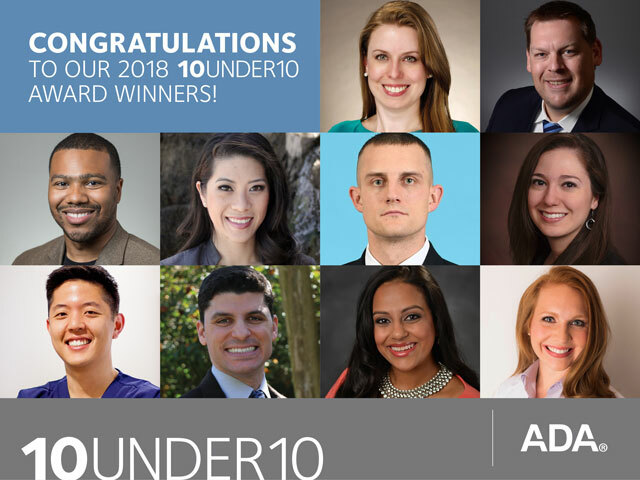 The 10 Under 10 award honors dentistry’s rising stars: dentists who are giving their all, sparking change and inspiring others – all less than 10 years after graduating from dental school. These winners have established charity events, mentored their peers, testified before lawmakers, helped develop innovative new technologies, steered young people toward careers in dentistry and so, so much more. They’re the future of the profession and, from what they’ve accomplished so far, the future’s looking bright. Dr. Kroll is a major in the U.S. Army, where he molds dentists straight out of dental school into Army officers and thriving, confident providers as assistant director of the dental residency program at Fort Sill. He also serves as Deputy Consultant to the Army Surgeon General for Comprehensive Dentists. Hi. I’m truly so proud of you. You finally made it.I know some time you wanted to throw in the towel, but that little voice you were hearing. Honey that was God talking to you, because he new you would make a dam good Dentist.God bless, and please enjoy your bright future. Polly Carter Racine Wisconsin.